When I'm on my way to or from Islay (which I will be again in mid August, but that's another story) I usually stop at Inveraray. More often than not (Shouldn't that read 'always'? Ed.) 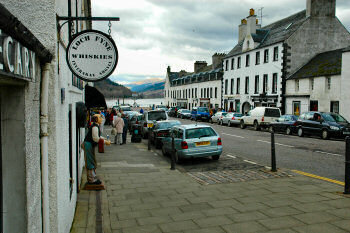 I also drop in at Loch Fyne Whiskies. I've also taken my mother and sister there when they travelled with me in April 2004 and July 2004 respectively. But what if Inverarary is too far away for you? Yesterday evening Ralf 'The Cartoonist' Zeigermann sent me an interesting link: Cadenhead's Covent Garden Whisky Shop. I haven't been there yet (and probably won't be anytime soon, as I'm not too keen on London, but that's yet another story), but their selection looks impressive. I hear that they fill bottles straight out of the cask, something I did at Bruichladdich a few years ago. I haven't opened that bottle yet, I'll leave that for some special occasion. Not sure yet which one, but it will be before 2010 or 2012 or whenever the Octomore Futures will be ready to be bottled.